Hello! Today I am here with a few projects made using the November My Monthly Hero Kit. This is a gorgeous new kit, just in time for Christmas. I have lots of details to share at the end of this post that will give you more info on this kit and a giveaway! If you are following along on the hop, you stopped in from my amazing friend, Jennifer's blog. Scroll down to see where to go next! I love making tags for my gifts and this kit works perfectly for just that! I stamped the tree, snowflake and star images and cut them out with their out "tag" die. The die cuts a hole in each shape and then you have a instant tag. I added a few little extra details, but I love to keep things easy to mass produce or recreate. I stamped the Christmas circle in red ink and added those to the Christmas trees. You can find that little circle in one of the add-ons called Holiday Badges. My favorite kind of card is a Clean and Simple card. So this next card was quick and easy and would be perfect for mass producing. I simply scored the card base every 1/2", then stamped and cut out the tree. I added in some stickles to the ornaments for a little shine. Next, I stamped the sentiment and then popped the tree up on foam tape for some dimension. So easy! This tag is called the Paper Layering Santa Tag. He cuts out in one piece but has all the little pieces that pop out so easily. To make this card, I masked off the bottom of the card and blended in some Delicata Golden Glitz, that is included in the kit. That gold ink blends so smoothly. I wish I could pick up all the shine in the photograph. Its so pretty! The sentiment is from the set included in the kit too. I added some black twine and a gold bell to santa's hat to finish off this card. ...plus lots of adorable add-ons to go along with the main kit! There will be a kit giveaway to one lucky commenter. The winner will be chosen from all the comments on the blogs along the hop, so don't forget to leave a comment. It could be YOU! Cute, cute, cute ideas! I had no interest in the Santa die until seeing this and now I must have it! Cute tags and cards! Love that Santa. Super cute! Love the Santa. The Santa card looks like fun. Great ideas and techniques. We all need tags and these are cheery and bright! Thanks for the inspiration!! Love the colors you used, awesome tags and cards! your tags and cards are amazing!! 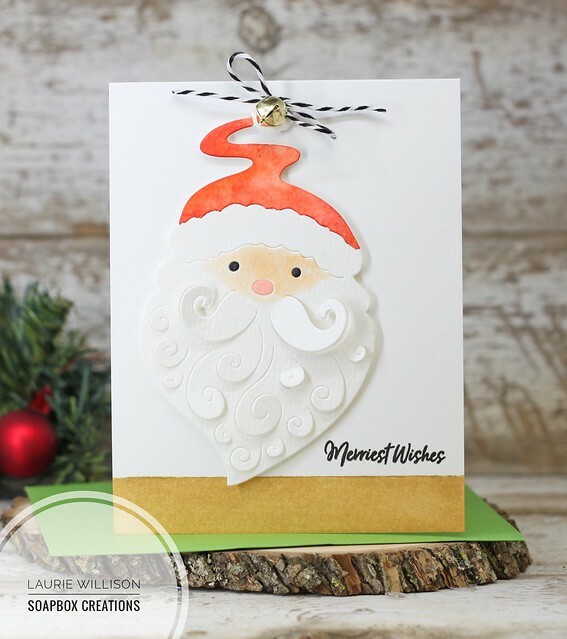 Your paper layering santa tag card is so cute. Gets me in the Christmas mood! Love the tags! They'd be great for baked goods. 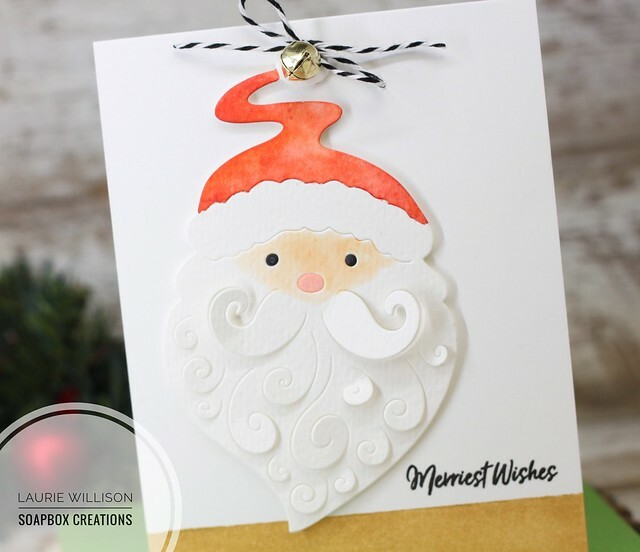 That paper layering santa tag is way too cute! I love tags to begin with, and yours are wonderful! 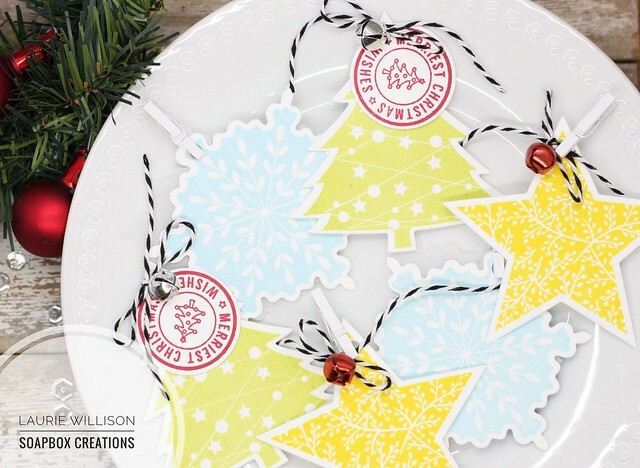 Those star tags look like cookies on a plate -- good enough to eat!! The Santa is so cute with his popup beard!! This is a wonderful kit and you have inspired me!! Nicely done... these shapes are perfect for tags. I need to check out the add on's. I like that badge for Merry Christmas. It's great the dies can be used to make tags. Beautiful artwork....love the cute Santa!! Love your Santa card....soo cute! Great projects. This kit has so much going for it. I love the cards and tags you made. That Santa is too cute. Thank you for sharing. What FAB & FUN creation! Love the tags! I make them each year, too, so this kit will come in handy. I love the Santa card, too. The Delicata inked edge is a great idea. Can't wait for mine to come, thanks for these great ideas. Lovely tags. I really love your Santa card. Very very sweet. Fantastic tags!! I would buy them if I saw them in a store. :) and your color combinations are lovely. I love that Santa! I ordered with my kit too because it was just too cute not to get him! Cute cards! Love the tree! I love the Santa die cut card! Lovely card and tags and super cute Santa! Thanks! Great cards and tags, the santa is my favourite. He's so cute! So cute - love the colors! Can't wait to get my hands on these. Who knew that just scoring the card would create such a beautiful and clean look! Thank you for the tip! The Santa die is so cute! Loved hearing about your dad playing Santa. Wonderful kit! Love love love your tags... I'm wondering about the colors you chose, because I think they look great! Simple put, just an awesome kit, for the most wonderful time of the year. You've certainly taken advantage with your beautiful projects. Wonderful tags, very easy to mass produce and help to make my gift packaging cute and coordinated. Thanks for sharing! This is such a great kit for the holidays. Enjoy making my own tags and your cards are so cute. Love the Santa Clause! Santa is just darling! Way to go Hero arts for this creation. And all your cards and tags are so inspiring. Thanks for sharing. I like the cute tags and cards you created. Your tags and cards are perfect. Sweet and pretty, cute Santa, too. I love your simple but beautiful cards! I love the CLEAN look of your cards. Thank You! Awesome set of tags and very cute cards... love that Santa! Such cute creations! LOVE the tree with sparkles and jolly Santa. Your projects make me smile! I love your clean style! Love all of your creations here. The card background behind the tree was so simple yet absolutely perfect as a little added interest, and I think your Santa card is delightful! These are all delightful Laurie! Love that Santa! I love the soft colors you used for your cards. Wow these are beautiful! Really love your cards. I love this kit and what you have done with it! The tags are adorable and the Santa is fabulous! Quick and easy tags. Love your Santa...a great die! Thanks for sharing! Lovely choice of colors! Such a great kit! The Christmas Tree card has such a unique background! The little Santa is very cute. He has such a sweet expression. This kit is super! Love, Love, Love the Santa! He is just adorable and another tag. Thanks for sharing your tags and super cute card! Love the colors and simplicity of the cards! Wonderful cards. I especially love the Paper Layering Santa. Beautiful tags and card, love that Santa tag! Cute tags and cards! I really love the Santa. We all could use more tags at Christmas to put on gifts. What a creative way to make your own. Loved your Santa cards too. Thanks for sharing. Hi. Beautiful cards and tags!! I love the November kit from Hero Arts! It's definitely on my wish list. I love how you scored your background......genius idea. Thanks for sharing. I love all the tags you made and the Santa is so cute ! The tags are really nice. Love the santa. Thanks for sharing. I love the Santa. Thanks for showing how he looks! What fun cards and tags, and the Santa is to "die" for! 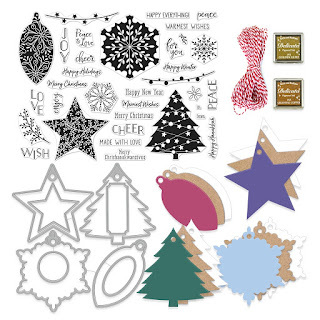 I am so in love with this kit, the star, tree and snowflake are so great and have so much what you can do with them. Thanks for you great cards. Such great tags for presents. And marvellous cards, easy for mass production. Love your projects, especially that santa. Thanks for sharing. Love the tags! I am going to make my tags early this year. This kit will help. These tags are adorable! That Santa is the ultimate as is this entire kit! TFS! I love his little bell topper! So cute! Awesome Kit! I especially love your Christmas tree card! This entire collection is adorable! I love the details in Santa's beard! Love the cards! The Santa card is great! What great memories of your Dad and this Santa is spectacular ! Great creations and a great kit ! Thanks for sharing ! 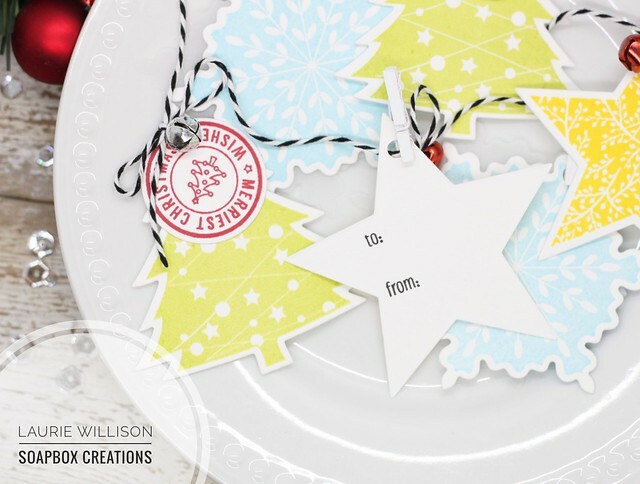 Beautiful tags and wonderful cards! 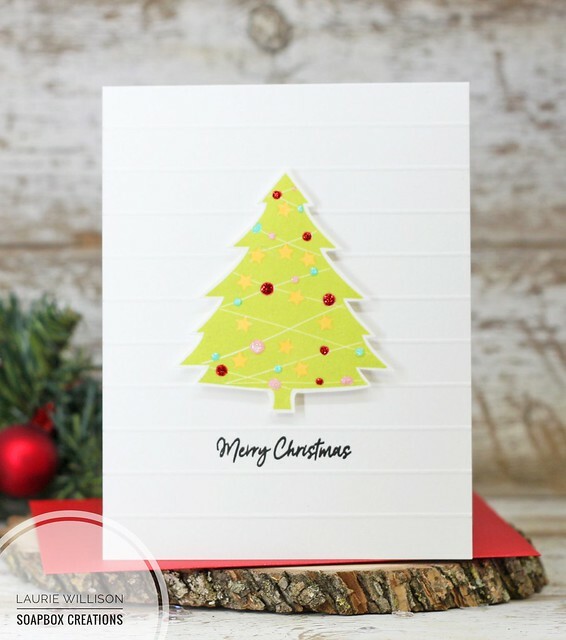 I really love the card with the tree and embossed lines. I love how clean and simple your tags and cards look! Gorgeous cards and tags, Laurie! I'm loving all of the fun elements in this kit...you have showcased them beautifully! Thanks for a chance to win! Your creations are all lovely and cute ! Beautiful cards! I really love the vibrant colour of the tree. Fun projects! This is such a great kit. Thanks for sharing on the hop!! Lovely card ideas! I love the Santa's twirling beard! Love your tags..so pretty. the Christmas tree card is great. Thanks for showing the Santa, he is very cute. Great looking projects. I think this kit is an instant "Go To". It just supplies whatever you need for tags whether you are looking for quick and simple or embellished "Wow". As soon as I saw your santa card, I knew I had to have that die. So cute! Beautiful cards and tags! Love the coloring/shading on the santa! Your cards & tags are pure perfection!! Love the tags and the cards! Love the tags and cards! Especially like the scored background - why don't I ever think of this stuff? Thanks for the inspiration! Love the santa layering die. I hadnt really known how to use these until i got one. They are pretty cool. Very nice cards and fun tags! That Santa is darn cute! Wow! Beautiful cards and tags!!! Beautiful cards and tags. I love the versatility of this kit and the ability to make tags also with the dies. Thanks! beautiful tags and love that simple (but lovely!) christmas tree card. thanks for sharing! The tags are super awesome! Love the father christmas card! Your cards and tags are adorable, Laurie. I never tire of your CAS style or your scored lines. Bummed I missed out on this kit as would love to at least have the stamps and dies. Oh well, that's life. You snooze, you lose. Sorry I haven't been commenting regularly but Google and Blogger aren't cooperating on my iPad (doesn't recognize me). Wonderful tags, especially the Santa. I really need to win this kit as it's sold out and I provide the stamps to make Christmas tags at our family Thanksgiving dinner. This kit would make our day as it includes the does to cut out the tags, the very important "to" & "from" stamps and even some string! You have made fabulous projects, I love all of them!